Feel that nip in the air? Winter is at our doorstep! There’s something exceptionally special about a winter wedding. There are the holidays to look forward to, Christmas gifts to unwrap, and a new year to celebrate. Not to mention, there’s no shortage of cheer during this season. Is it just us, or is everyone generally in a better mood in December? We sure think so. Below are two dresses we believe best captures the winter wedding aesthetic. Of course, sleeves come to mind, but they don’t have to be traditional. No ma’am, these are not your grandmother’s lace sleeves! This gorgeous Allure style keeps the heat turned on with it’s plunging off-the-shoulder neckline. Best of all? The back. If you’re looking for a modern, yet vintage inspired winter wedding dress, this is your gal. This stunning Casablanca style is the perfect pick for the bride who desires a timeless elegance. This style features a structured A-line satin skirt which is almost iridescent in its gorgeous luster. The gentle gathers and hidden pockets are other stand-out features of this skirt. 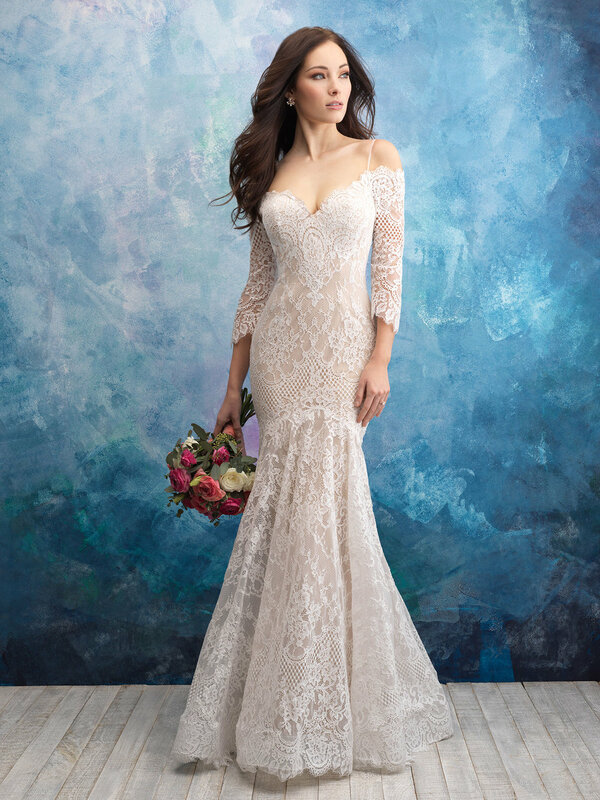 Silvery beadwork swirls across the V-neckline bodice, up into spaghetti straps and across the low, wide scooped V-back shape of this gorgeous gown.